Christmas markets are traditional, festive street markets and are typically composed of many different local stalls, often clustered in a big square, and are just the place to get into the Christmas spirit. They serve to usher in Christmas and are usually open for four weeks every year around Christmas, and each country has their own specific time for them, starting as early as mid-November in Austria, for example. Christmas markets have been around for centuries; the first Christmas market was held in Strasbourg (now in France) in 1570 and most people called that the “Christkindelsmärik” in German – its English equivalent is the market of the Infant Jesus.iToday, Christmas markets are becoming an increasingly popular in many European countries, such as the UK, while they have always been a key part of the holiday season in Germany, for example. In Budapest, there aren’t many Christmas markets, but you can always find some good ones and the choice is getting better. 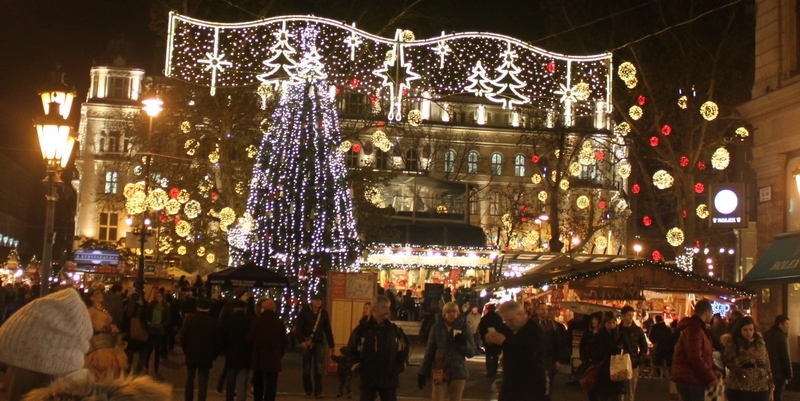 The best-known Budapest Christmas market is centrally located on Vörösmárty Square (tér), in the center of the city in District 5. The Vörösmárty tér Christmas market has a very short history: it opened in 1998, but it is the most beautiful and internationally-acclaimed of Budapest’s Christmas markets, as well as the most traditional. Here, you can find and buy many products that are all handmade by the old traditional ways, and you can feel the love and care behind the maker’s products. Somethings like glass blowing, knitting, wood carving, candle making, pottery, leather trade, traditional Hungarian embroidery and lace work, etc.ii Also, you can taste a lot of traditional Hungarian food and drinks, such as Krampamouli, stuffed cabbage, strudel, grilled sausages and meat, Christmas cookies, kürtös kalács, etc. The best thing for the people who go there for the first time is to see all cooking processes from the open kitchen. This market runs until January 6. A relative newcomer on the Budapest Christmas market scene can be found on Szent István tér, next to the Basilica, also in District 5. This market is less traditional and more hip with lots of contemporary food and drink, from gourmet burgers and hot dogs to modern Hungarian craft beers and wine from the uber Divino, including warming mulled wine. Watch out for the light show on the Basilica after dark. This market goes on until January 2.